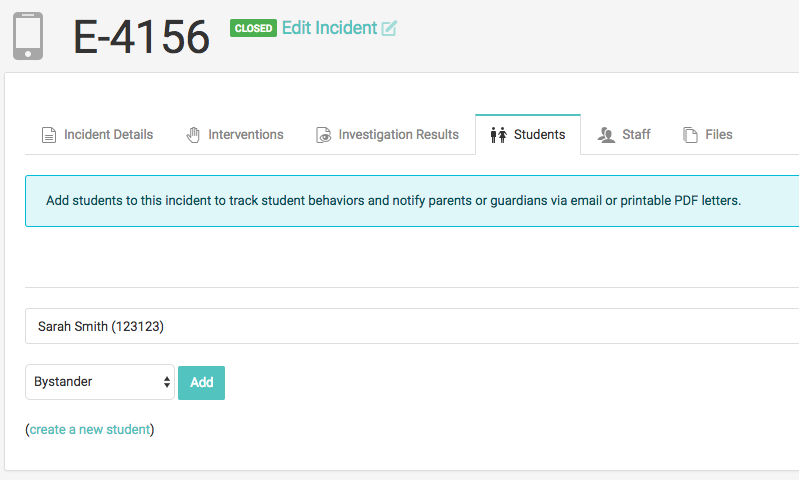 Students can be associated to an incident so their involvement can be monitored over time. Each student has his or her own profile or “file” in BRIM. 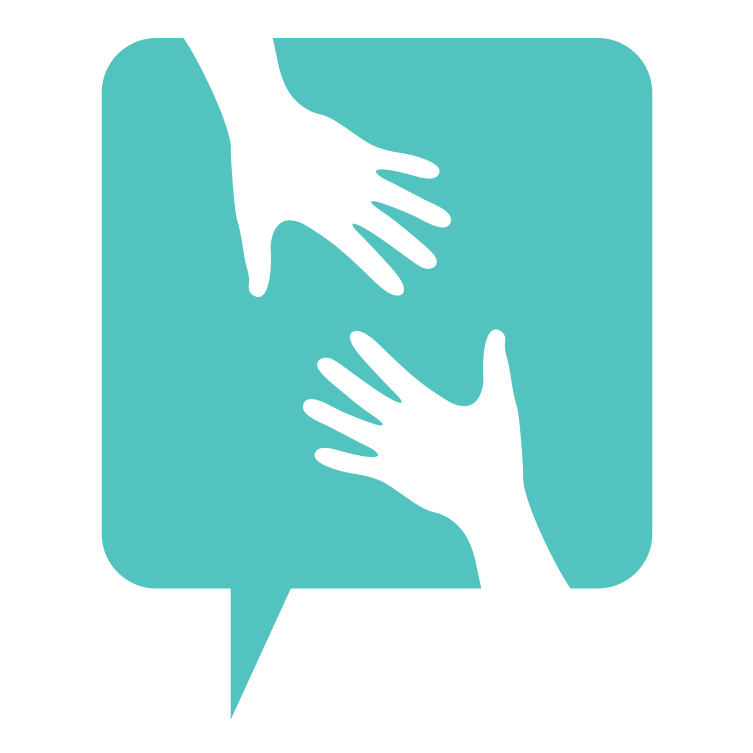 When an incident occurs, the staff member investigating the incident associates any involved students or participants. Below Sarah Smith was a “Bystander” and so she is linked to the incident in the “Students” tab. The staff member searches for “Sarah Smith,” selects “Bystander” from the dropdown and clicks the “Add” button. The staff member might also add a “Victim” and a “Bully” to this incident. Each student has his or her own profile or “file” in BRIM. 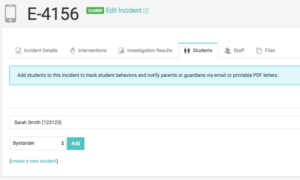 A staff member can view this file and monitor how this student is involved in incidents, either in a positive or negative way. Below we can see Sarah Smith was a Bystander in one incident and a Bully in another incident. 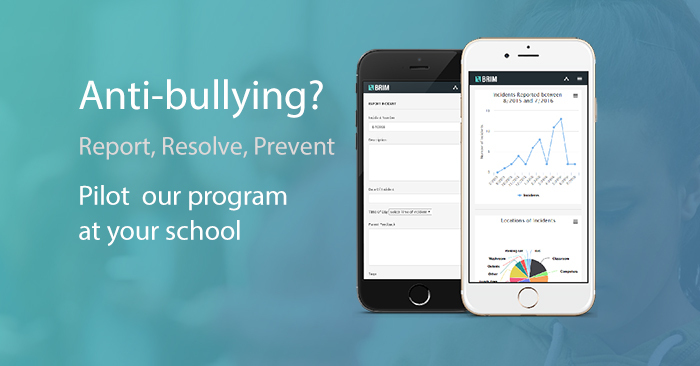 In addition to viewing “Related Incidents” on the student profile we can send or generate a Parent Letter for the specific student if they were a bully or a victim involved in an incident. After clicking on the student profile, look under the “Send Letter to Parent/Guardian” heading and select the type of letter you would like to send or generate. 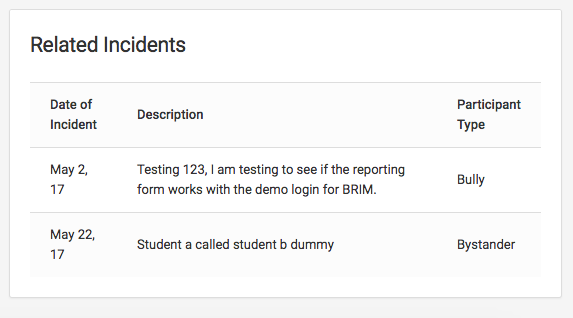 View this tutorial for more detailed instructions on sending parent letters through BRIM.